Steve and Chickey Hernandez award winning ’56 F100 in Southern Ca. When it comes to classic trucks if you ask 100 people what their favorite model is, chances are good you’ll get 100 different responses. The 1957 Chevy Apache is a big hit with folks, the 1950 Dodge D-100 is one of the coolest in terms of classic style and who would argue with a 1955 GMC 100 Stepside? For many of us here at Horsepower Broadcasting, the 1956 Ford F100 pickup is the clear favorite. Few trucks have inspired the classic truck world quite the way the second generation Ford pickup truck has which may explain the almost cult-like following it’s developed. The 1953-1956 Ford F100 Pickup had a cleaner, more modern style than the first generation pickup. It looked tough, solid and had outstanding looks. Another big part of the F-100’s appeal was a well-designed cab that was comfortable to drive with easy to reach controls. Many critics of the early second generation trucks contend that they weren’t that powerful. The 101-horsepower 6 cylinder and 110-horsepower flathead V-8 were carried over from earlier years and lacked sufficient low end torque. Then in the mid 50’s, the flathead was replaced by a new overhead-valve V-8 that was kicking out about 130-horsepower. Late 1950’s versions of the V-8 generated somewhere near 176-horsepower and the output for the six cylinder also continued to rise, getting at or near 137 horsepower. On March 13, 1953, the Ford-O-Matic transmission became an option and of all the automatic transmission designs of the time period, the cast iron Ford o matic was probably one of the best. The geartrain was so reliable that Ford used the design all the way through 2008. Many revisions occurred over several decades but the basic geartrain design endured for nearly 55 years. The original stock suspension was a bit unreliable and many owners back in the mid-50’s complained that it was difficult to keep the truck in the lane at higher speeds. The steering gear box was traditionally sloppy and the large diameter steering wheel only exacerbated the problem. Today, there are a number of quality suspension upgrades for the 1st and 2nd generation F Series pickups that are reasonably simple to implement and are reasonable in terms of cost. 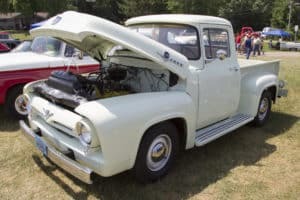 For me, the 1956 short bed F100 will always have a special place in my memory as my dad took me to school each morning in his old truck that he bought new. I’ll never forget the feel of the interior, the instrumentation layout on the dash, or the many father-son talks we had while cruising Southern California in the late 60’s. 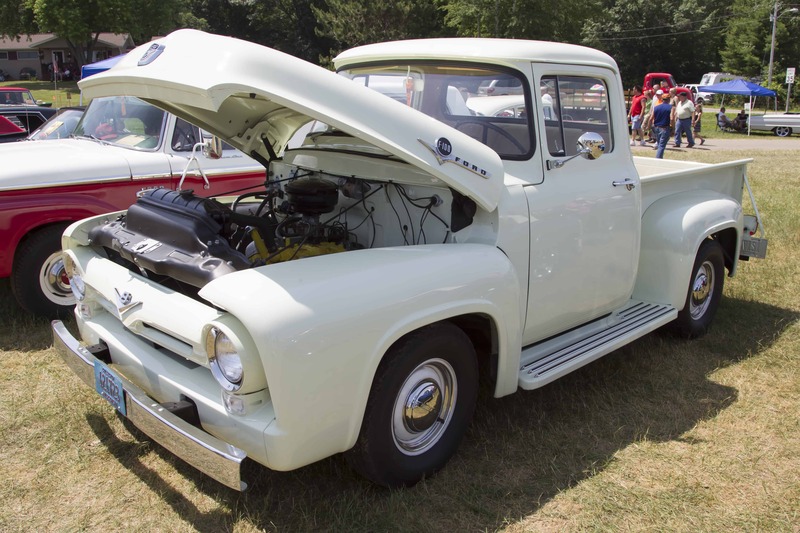 Whether you’re a fan of the Classic Ford or not, I think all would agree that the 1953-1956 Ford F100 pickups are legendary in today’s classic car market. 1956 Ford Pickups always a sharp looking truck when customized…. Love Horsepower For An Hour Blogs….quick nuggets of automotive history and knowledge!!! Nice Donny! Love the old classics… easy to work on too! Love classic cars…restoring them is my father’s long-time hobby since he was in the Air Force back in the early 60’s. Enjoy your radio show on KVCE AM1160 – Dallas/Fort Worth!